Marian Kruczek was born on 27th December 1927 in Plowce near Sanok. In 1946 he went to Cracow to study in high school of fine arts. After completing high school diploma in 1948 he started studies at Academy of Fine Arts in Cracow. In 1954 he had graduated (his master’s thesis was written under the academic auspices of professor Łukomski). Afterwards he became lecturer in above-mentioned Academy. He was painting, sculpting, creating engravings. His works have been exhibited in over 50 individual exhibitions and more then 150 collective expositions in Poland and abroad, inter alia in Maya Gallery in Brussels, Grona Paletten in Stockholm, Bundy Art Gallery in New York or in Yvon Lambert Gallery in Paris. 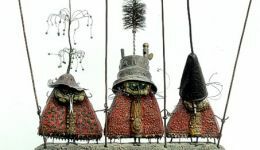 Combination of occasionally found things – parts of machines, cogs, wires, screws, beads, shells – served him to create original art from the verge of folk fairytales and animal like fantasy. His spatial compositions, sculptures and reliefs or engravings form suggestive world of artistic vision.